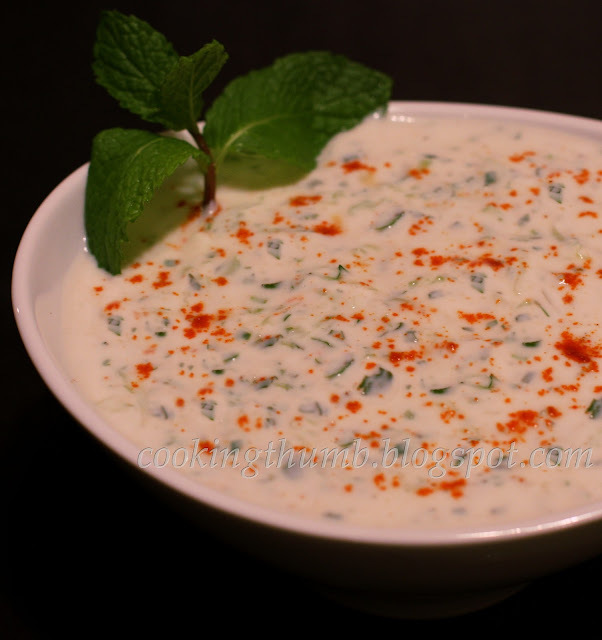 Cucumber Raita (also known as Kheerey ka Raita in India) is a cucumber-yogurt sauce used in Indian cuisine. You may have heard the phrase "cool as a cucumber", but trust me - Cucumber Raita is cooler :) Because of this attribute, it is used as cooling side dish when the food gets too hot and spicy. Add the yogurt in a bowl. Beat it well until it becomes smooth. Add cucumber, mint, salt as per taste, black salt, cumin powder to the yogurt. Mix well. Garnish with cilantro & sprinkle paprika (or red chilli powder) on top before serving. I HAVE A HARD TIME PRINTING YOUR RECIPES. ANY SUGGESTIONS? THEY ALL SOUND SO GOOD. 1) Open the recipe web page on any browser. 2) Click "File > Print" from the browser's menu bar. 3) The Print dialogue box will open up, choose your printer & click print.